Offered here for your perusal is my pen collection. I have been collecting fountain pens for many years and I collect both modern (i.e. brand new) and vintage (antique) pens. My favorite modern pens are Bexley, Visconti, Pelikan and Waterman and my favorite vintage pens are Sheaffer (like the beautiful vintage Sheaffer Snorkel pictured at right). Most of the vintage pens in my collection I restored to perfect working order myself . And each one is periodically filled with ink and used. I have listed the pens in alphabetical order by manufacturer. I have also placed a magnifying glass next to each one. If you click on the magnifier it will bring up another window with a larger image of the pen. On most browsers, if you then double click that picture you can magnify the large image even more. One more thing I want to mention: some collectors collect only certain model pens, only very valuable pens or only pens of a certain vintage or era. I collect pens that catch my eye and move me to purchase them with no restrictions. For instance, one of my favorite pens is a "no name" brand (there really is no name on it) that I happen to love. It is very beautiful and a very smooth writer. Just because it has no name or any real value to collectors means nothing to me because........I like it! And to me anyway, that is what collecting is all about. So here we go - in alphabetical order. I hope you enjoy the collection! Aikin Lambert Company according to Fischler and Schneider, was a New York City jewelry manufacturer that commenced business in 1864. Part of their production included dip pens and gold points (the points were called "pens" in those days), in addition to pencils. It wasn't until 1890, however, that they turned their attentions to the fountain pen, although this of course still makes them pioneers. They seem to have been influenced heavily throughout their run by the products of fellow New Yorker L.E. Waterman; in fact, they enjoyed very close business relations with Waterman and were eventually absorbed by their larger and more famous neighbor. Aikin Lambert pens are very similar to Watermans, although possibly a half-notch or more better in quality, as befits a company that started in the jewelry trade. The most prized ALCo pens seem to be their 19th and early 20th century overlay pens, which sometimes sell for less than Watermans of equivalent pedigree. My 1925 Aikin Lambert in perfect working condition. This pen still writes beautifully 86 years later. When we think of a precious object, we think of something in which man has managed to blend his extraordinary creativity with his best manual dexterity. Ancora believes this to be real value, not only of a pen, but of any precious product. Cellini casts, Michelangelo sculptures and Leonardo paintings are marvelous examples of how matter becomes, through man’s creativity and manual dexterity, unique and, at its highest expression, works of art. Ancora treasures this philosophy, paying great attention to special features and, most of all, the values of that most perfect of creative machines, the human hand, an unreachable goal for mass production manufacturers. Therefore each Ancora fine Italian pen is made entirely by hand by master craftsmen and never by machine. Since 1919 Ancora has manufactured unique fountain pens which authentically represent the beauty of Italian style. Ancora pens are forged from a special solid resin and accented with 925 sterling silver. Each 18k Gold Nib is hand finished and engraved with an intricate scroll design. Only a limited number of these pens are produced, each with unique characteristics and each a product of masterful Italian craftsmanship. When you are using an Ancora pen you have in your hand the most refined Italian craftmanship. My Ancora is a beautiful Blue Perla model which I purchased at the 2008 Philadelphia Pen show. The Perla is made from a special Italian resin used exclusively by Ancora which creates a splendor and brightness that reproduces all the richness and iridescence of the pearls of the south seas. Each Perla Fountain Pen is unique, and has completely different coloration and hues. My Aurora is the Classic Black 88 Model that I bought from Richard Binder at the 2009 Philadelphia Pen show. The 88 is an unforgettable fountain pen from the 50s, and in recent times the legendary 88 has been re-introduced by Aurora in a version that is virtually identical to the original model. Note the clear ink window that lets you see how much ink is in the barrell. The Bexley Pen Company was founded in 1993 by a handful of vintage pen enthusiasts. After decades of admiring, collecting, and restoring vintage writing instruments, they wanted to use modem technology to create American classic designs reminiscent of the Golden Age of Fountain Pens. Today Bexley manufactures high quality writing instruments in Columbus, Ohio, USA and distributes them to dealers around the world. Bexley designs take inspiration from the classic pens of day’s gone by. They create designs with shapes reminiscent of classic design trends, like streamline shapes that were popular during the 1930's in everything from locomotives to household objects. Bexley takes great care to make distinctive writing instruments for the discerning customer. They use computer controlled equipment, and decades of precision manufacturing experience, to produce components to exacting specifications. Skilled craftsmen carefully hand assemble and polish each Bexley pen. Bexley makes some of my favorite pens. They are the perfect size, have perfect balance, are beautifully shaped and write smoother than many other pens made today. My first Bexley is an Americana in classic black. The Americana is a pen reminiscent of the Art Deco style fountain pens popular during the 1930's. The pen has 8 facets on the cap and barrel similar to the 1930 Doric. Each pen is machined from a solid block of beautiful cast acrylic resin, and features a faceted clip and pierced cap band. My next Bexley above is a Submariner SE model in Red Pearl. Bexley made only a limited number of these beautiful writing instruments in this special color for Richard Binder, making it a true Special Edition model. Bexleys' are known among pen enthusiasts for their buttery smooth writing abilities and mine is no exception. The Bexley Sheherazade is named after the Legendary heroine of Arabia in "A Thousand and One Arabian Nights". As the never ending story was told, long, long ago by Sheherazade to her new husband, the design and materials used for this pen conjure up images of stars twinkling in the Arabian night sky. The pen has silver specks representing the "stars" that cannot be detected in this photo. This pen features a Richard Binder customized Italic nib. There is elegance in simplicity and Bexley achieves it with a graceful, uncluttered design. My Bexley Simplicity is a color I love known as "Cracked Ice" and features a Richard Binder customized Italic nib. My last Bexley is a magnificent Aspen Submariner Grande with colors of brown, gold, blue and red with gold trim. The pen is so exquisite that photos cannot do it justice. I just couldn't possibly photograph the full spectrum of hues with my meager equipment. The gold section behind the nib provides a little extra weight at the front that makes the pen balance perfectly in your hand for comfortable writing. I can't decide which Bexley writes smoother - they are all out of this world! Bossert & Erhard is world renowned for it's craftsmanship, using translucent enamel and sterling silver to create one of the most unique writing instruments available. Distributed on an exclusive basis to jewelers and manufacturers/dealers of high-end writing instruments, these exquisite pens could easily be called the Mercedes-Benz of writing instruments. In fact, they are manufactured in a plant not far from the famed carmaker's facilities in Stuttgart. Founded in 1919 in Baden-Wurtenberg by savvy businessman Christian Bossert and clever technician August Erhard, the company initially produced a variety of executive personal accessories including desk pads, manicure sets and fountain pens with a draw and twist mechanism. Today, the company's exquisite line of elegant and distinguished pens features the highest quality refill mechanisms with nibs that are made for the exclusive use of Bossert & Erhard. And like the famed Mercedes Benz, the quality of a Bossert & Erhard writing instrument is beyond compare. My B&E is made of solid sterling silver with guilloche pattern on the barrel, which has then been coated with thick blue yet translucent lacquer. Click on the magnifying glass and you can see the silver pattern beneath the blue glossy surface. Although it writes as smooth as silk, this pen is a beautiful piece of jewelry as well as a fine writing instrument. Russian for “pencil,” Karandach was also the pen name of a great French caricaturist. Drawing on both these meanings, Caran d’Ache S.A. started making some of the world’s most beautiful pens in 1924; these true “Swiss Made” products proudly carry the internationally recognized quality label. Based in Thonex, Switzerland, near Geneva, they’re surrounded by incredible natural beauty — and a country renowned for the skill and precision of its watchmakers and jewelers. Since they remain Switzerland’s only manufacturer of pencils and exclusive writing instruments, it’s no surprise that Caran d’Ache has an international reputation for exceptional beauty and quality in all of their products. For more than 75 years, they have been leaders in innovation and believers in evolution with an unchanged philosophy: Quality has no limits. My Caran Dd'Ache is a beautiful grey marbled Equinox that is an impressive writer. Begun in 1905 by two young Englishmen named Thomas Howard Garner and Frank Jarvis, the name Conway Stewart tends to be attributed to the names of two comedians, Conway and Stewart, who were then appearing at Collins' Music Hall in Islington, and purportedly used as aliases by Garner and Jarvis. But despite the absence of recorded history, Conway Stewart pens have been prized for their high-quality craftsmanship for over 90 years. Prime Minister Winston Churchill (who was among Great Britain’s most prolific writers) used a Conway Stewart pen during World War II. Queen Elizabeth received two gold Conway Stewart pens for her golden wedding anniversary, and Prime Minister Tony Blair presented a No. 58 set to each leader at a G8 Summit. But the value of a company whose very name evokes nostalgia is that they continue to produce instruments both for the every day user and the pen enthusiast who seeks 'par excellence', ensuring that nostalgia will last long into the future. And, there is no doubt that Conway Stewart has always made and continues to make some of the finest pens in the world! My Conway Stewart is a gorgeous 1955 Blue Hatched Model #27 that definitely lives up to the Conway Stewart name. Both of these were purchased at the 2009 Philadelphia Pen Show. With manufacturing based on the Huangpu River of Shangai, China, the Shanghai G. Crown Fountain Pen Co., Ltd. produces a marvelous line of founain pens, called DUKE. Registered in Europe as German Duke Lux Pen GmbH., and drawing heavily upon its R&D sub-branch located in Germany, the DUKE brand uses advanced German and European pen-making technology, and employs it to bring traditional Chinese motifs to mid-range and high-end pens and limited editions. Made from some of the finest materials, such as Italian celluloid or resin, gold, silver and Chinese lacquer, the range of model designs is impressive - including models made of abalone and pearl - and many only produced in very limited quantity. I purchased my Duke pens from Todd Nussbaum at Isellpens.com. There you will find a huge selection of very reasonably priced pens from the Orient. But don't be fooled by the prices - Chinese technology has come along way and many of these pens will write circles around their European counterparts! The first is one that Duke calls "Bright Pearl Dark Sea" and photos cannot possibly do it justice. The pen is inlaid with gorgeous abalone and mother of pearl. The next one above has a stunning red carbon fiber barrel. The last Duke is a unique inlaid filigree with a real ruby in the top of the cap. "I always loved woodworking, specifically marquetry furniture. You can see my woodwork at www.briangray.net (has not been updated for a very long time....) I used a wood lathe, and found that kit pens were....interesting. At the time, I was already collecting fine pens, vintage and modern. I found the kits to be very limiting creatively, very heavy, and not really what I wanted to do. So I picked up a metal lathe and starting learning how to cut threads. I decided that if I couldn't make my own components, I wouldn't bother with pens. The kits just didn't do it for me at all. This was around 2006. I started a little business, and called it "Pencraft". Things actually started to sell. I then switched to "The Edison Pen Company", as we live in Milan, OH, the birthplace of Thomas Edison. Every model pen that I make is named after Thomas Edison in one way or another. I did pharmaceutical sales since I graduated from college in '96. I loved it, until the last three years of it. The pharm industry just went to hell fast, and I learned to hate my job. I went through three lay-offs in three years. Very stressed, always worried, always tense, and probably didn't win any awards for best husband or father, as I was just always super-busy doing work that was counter-productive, and made my life hell. So with the third layoff, my plans were to just keep the pen thing going to keep myself off of unemployment until I found yet another job that I hated. Well, when you spend 8-12 hours a day at your trade, rather than 8-12 hours a week, things start to happen. The next thing I knew, I was actually paying the bills with pens! I never collected one unemployment check. The business has grown every month since, and I couldn't be happier." Indeed there is a reason why the business has grown every year - Brian's pens are great! You can see all the pens Edison Pen Company makes at http://www.edisonpen.com . My Edison pen was custom made for me and is the Herald model. It is my first Edison and most certainly will not be my last - I love this pen! I ordered the pen with two nibs: A fine point and a medium Stub Italic. Both are among the smoothest nibs I have ever used on any pen regardless of price. That is one of the best things about buying an Edison - Brian is not only a great craftsman but also a great nibmeister. Every pen he sells is fine tuned to perfection and he can custom make the nib you want the way you want it. My Herald is made of Red/Black Ebonite which is actually a hard rubber found in vintage pens (before the age of plastic). However, when you buy a pen from Edison you can choose from many different colors and patterns in different materials. You can also choose from many different unique filling systems including a Bulb Filler. Having used and collected pens for may years I can say with certainty that I am very impressed with Edison Pen and so are many other pen enthusiasts. There is a good reason why we are impressed and buy Brian's pens: the reason is because they are fantastic! Well, as I mentioned above the Herald will not be my last Edison and my newest Edison proves it. Above is my Edison Nouveau Premiere which is available only from The Goulet Pen Company. Mine is in Cappuccino And what a beauty it is!!! Edison Nouveau is a joint collaboration between Brian Gray of the Edison Pen Company, and Brian Goulet of the Goulet Pen Company. As was the case with my Edison Herald, my Edison Nouveau is one of the finest writing instruments I own. I also want to say that The Goulet Pen Company is a unique company and they really cater to fountain pen enthusiasts with great customer service. They are also one of the best places to purchase fountain pen ink and even samples of ink (so you don't have to buy an entire bottle and find out you don't like the color!). They really have put a lot of work into helping you chose the right color from their website. This is my Edison Collier in Antique Marble purchased from Richard Binder at the 2012 Philadelphia Pen Show. This is a super Pen in an amazing color! I just had to buy another Edison! This pen does NOT post (meaning the cap does not fit on the back of the pen), so I am showing the pen and body separate. I always write with my pens unposted so this is not a problem for me. Esterbrook Pens was created in 1856 by a Cornish Quaker, Richard Esterbrook. He was a stationer by trade and had seen in Britain the move from hand cut Quill pens to the steel nibs with their consequent advantages. He was also a wise businessman with an eye for opportunity and saw that there was no steel nib manufacturer in the U.S.A., a vast expanding potential market. He recruited 5 craftsmen and set up operations in the town of Camden, New Jersey. The initial company was named the United States Steel Pen Manufacturing Company, later being changed to the Esterbrook Steel Pen Manufacturing Company. This amazing company actually expanded during the Great Depression (1932 - 1940), while most pen companies, including the "Big 4" (Parker, Waterman, Sheaffer and Wahl/Eversharp) experienced greatly reduced sales, and many other pen companies closed altogether. Esterbrook fountain pens today are sought after by serious writers. These inexpensive but well-made pens were unique in that they were designed with a user-interchangeable screw-in “Renew-Point” nib assembly. Renew-Points came in a broad array of sizes and types; the customer could choose pen and nib separately for a truly personalized writing instrument. My vintage Esterbrook is a Cobalt Blue J with a No. 1550 “accounting” nib in mint condition from the late 40's. HAOLILAI Gold Pen Co., LTD. is a Chinese manufacturer specializing in middle to high end fountain pens, rollerballs, ballpoint pens, gel pens, pencils and other writing instruments. Haolilai (pronounced "How - Lee - Lie") was established in 1989 in Shanghai and is a member of the China Pen-making association. They are a well respected pen maker in China under the brand name “Haolilai” for their fountain and ballpoint pens and “CCHN” for gel pens. Most of the raw materials used for their high end pens are imported from Europe such as beautiful Italian resins and Swiss nibs. The high quality imported materials, hi-tech automatic machines and a core group of highly skilled craftsmen have made them a leading brand in the China pen-making industry. My first Haolilai is a Model #801F and is a beautiful orange gold resin with black veining. The pen has gold clip and accents and a 14 K solid gold nib. This is one beautiful pen and a great writer! Above is my model #601F and is a real beauty that no photo can do justice. It has a beautiful lacquer applied finish with gold and copper sparkles. This is truly a great looking pen! The Shanghai Hero Pen Company, popular for its Hero fountain pens was founded more than 75 years ago as the Huafu Pen Factory. It was renamed to Hero in 1966. Some of its brands of fountain pens include Hero, Doctor, Wing Sung, Happiness, Huafu, Xinming, Guanleming, Xinhua, and Gentleman. As one of the oldest, and largest, pen manufacturers in China Hero has been the major supplier of pens and fountain pens to all of Asia for decades. Hero fountain pen models range from beginner and school pens, to everyday 'writers', to heirloom pens for the serious collector. I purchased my Hero pen from Isellpens.com. Hero 892 with Gold Accents. This pen is just magnificent with all the colors of seashells in the resin. No picture does any justice to this stunning pen! Jinhao pens are a division of the Shanghai Qiangu Stationery Co. established in 1988 and located in Nanchang Jiangxi Province. In 2003 the company moved to Shanghai. The company has two manufacturing factories with 300 workers. After years spent in development, the company has become a standard stationery enterprise with research, design, and manufacturing of high quality writing instruments. The appealing design of their pens is inspired in the Chinese tradition. The writing instruments have a tapered, ergonomic writing grip section that rests perfectly in the hand. They are truly high quality pens at a very reasonable price. I purchased my Jinhao pens from Todd Nussbaum at Isellpens.com. There you will find a huge selection of very reasonably priced pens from the Orient. But don't be fooled by the prices - Chinese technology has come along way and many of these pens will write circles around their European counterparts! Above is my Jinhao X450. This pen has one of the largest nibs I have ever seen - easily as large as a Mont Blanc 149!!! My Jinhao I Ching has 13 sides (13 is not an unlucky number in China)! I also love the red ruby eyes of the dragon clip! My Jinhao Dragon's Descendant has a dragon embossed in gold and a dragon clip with ruby eyes. This pen is as big as a MB 149 and the nib is formidably larger! This pen is a superb writer and one of my all time favorites. Made in Heidelberg, Germany, Lamy pens epitomize quality, innovation and modern design. The Lamy brand holds a promise: LAMY: No design writes better. 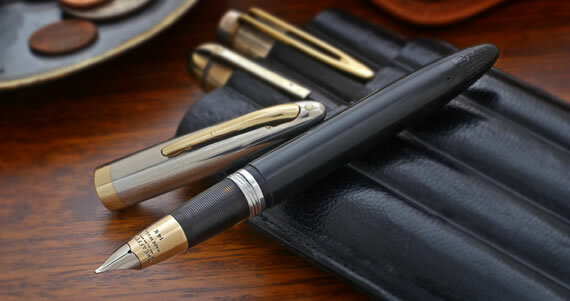 Josef Lamy, who was a sales representative for The Parker Pen Company in Germany, founded the business in 1929 by purchasing the Orthos pen manufacturer. Lamy was a pioneer in the use of molded synthetic plastics to make their product. Lamy is currently run by Josef Lamy's son, Manfred Lamy. Lamy is a design-driven company if ever there was one, with pens drawing on everything from Bauhaus style to postmodern Italian industrial design. Functionally, Lamy ranks with the best; Manfred Lamy once said that perfect function has to be assumed in each of his pens, and his products bear his words out. A new Lamy writing instrument is an exhibition piece for the designer, engineer, or technician who made it, and its technical composition and shape are designed specifically for excellent performance. Lamy's German quality has been impressing writers the world over since 1929. I own two Lamy pens and they are both at the top of the list of my all time favorite writers. Above is my Lamy 2000. First introduced in 1966, the Lamy 2000 is a model of timeless design. Even today, many people regard it as one of the world's most modern writing instruments. The 2000 is a combination of Makrolon reinforced by fiberglass and brush-finished stainless steel, and the spring-operated clip is made from solid stainless steel. The timelessness of this design is evident by the fact that the 2000 is still being sold more than 30 years after its creation. A rugged yet sporty pen, The Safari is a modern-industrial design in a lightweight plastic. Enhanced with a black chromium-steel nib this is a reliable writing instrument and one of my functional favorites. A three-sided grip zone and surefire ink delivery all make the Safari an instrument with more than enough quality in the details. Jean-Pierre Lepine descends from a long line of French High-Jura manufacturers, inspired throughout the generations by tradition and innovation. Today, he upholds the lineage of exquisite craftsmanship through his writing-instruments, specifically designed to "amaze and make people dream." A team of craftsmen in the French workshop operate through small production batches, dividing the creation amongst skilled individuals, each lending their expertise to bring Jean-Pierre Lepine's designs to life. I own two Lepine's: the beautiful multicolored Casanova model above and the unique black and white Samba model below. One of the longest-lived makers of writing equipment, Mabie Todd & Co. began producing dip pens and mechanical pencils in New York City in the 1840s. Gold nibs were added to the line through an association with Bard Brothers. Mabie Todd & Bard (as the firm was then known) took out its first fountain pen patent in 1878, and over the next decades its constant innovation put it at the forefront of quality fountain pen manufacture. Export to the UK began early, and a London office was opened in 1884. Manufacture of pens in the UK began around 1909, and by 1915 the UK side of the business had become so dominant that it bought out the original New York firm. Manufacture continued in the USA on a steadily diminishing scale throughout the interwar years. Although the company initially prospered in the immediate post-war period, production ceased before the end of the '50s. Today Mabie Todd's are sought after by collectors. Mine is a beautiful brown stripe colored Swan model from the 1930's. Producer of Italy’s great hand-made pens, Marlen describes its pens as not just objects, but works of art. The Marlen brand portrays technologically perfect writing instruments, all of them inspired in architectural beauty, poetic brilliance, and historic importance. Many limited editions are devoted to pay tribute to some of the greatest personalities of the artistic, cultural, and literary world. These factors make Marlen highly distinctive because they capture the subtle elegance of time with technical and artistic perfection. Each design that Marlen makes is designed to be a one of a kind and is only manufactured in very limited quantities. This makes Marlen Pens highly sought after and collectible. My Marlen design (below) is the Marlen XXI. This elegant pen is dedicated to the 21st Century, which unveils the new and exciting third millennium. This precious and refined writing instrument has a super-smooth Marlen nib made from solid 18k white gold and Marlen's trademark 925ag solid sterling silver trim. The faceted barrel of the XXI is created from sterling silver and the barrel is dodecagonal (12-sided). The sterling silver barrel also bears an elegant design, as can be seen in the photograph. The XXI's cap, blind cap, and grip section have been crafted from a beautiful, translucent acrylic resin in deep gray flecked with red. These two materials make the XXI a very unique and attractive fountain pen. The XXI bears a wheeled clip to ease insertion and removal from a pocket or a pen case. The Marlen XXI fountain pen is definitely one of my favorite pens in my collection. Montblanc has been known for generations as a maker of sophisticated, high-quality writing instruments. Founded by a Hamburg stationer in 1906, the company began as the Simplo Filler Pen company in 1908, then adopted the Montblanc trademark three years later. As the highest peak in western Europe, Montblanc really does belong to the whole continent. Its many glaciers are rendered in the company's trademark white star found on all of their luxuries. Since its inception the company has been producing some of the world's most well-known writing instruments and added extensively to the world of luxury with new lines of leather goods, eyewear, desk accessories, jewelry, and fragrance. As a premier purveyor of exclusive products, they reflect today’s demands for quality design, tradition, and master craftsmanship. My Mont Blanc 149 Fountain Pen - The Grande Classic!!!!! My Mont Blanc LeGrande 146 - a magnificent writing instrument. Monteverde® division of YAFA pen company offers high quality and elegant writing instruments that combine the finest European resins, celluloid's, and carbon fibers with state-of-the-art ink technologies. The origins of Monteverde® stemmed from more than 30 years of service to the fine and luxury writing instruments trade in the United States. The experience and success accruing over 30 years, earns Monteverde®, itself a relatively new collection, the esteem of being sold through the finest pen shops in America and worldwide. Monteverde®’s strategy is to offer ballpoint pens, rollerball pens and fountain pens, all in colors that redefine the words “color palette”, at price points that invite both a broad consumer base, and fine pen aficionados. Materials are sourced from suppliers throughout Europe to insure unparalleled quality and performance. The pleasure of writing with a Monteverde® writing instrument is made even greater because of Monteverde®’s popular price points. My Monteverde Black Stealth Invincia™ above is a pen in all black with sophistication that definitely gets noticed and yet remains understated as it flies “under the radar”. The 3 layers of durable black lacquer create depth and brilliance with the barrel, clip and trim all in matching black. This pen even has a new and unique black nib that is titanium-coated stainless steel for extreme durability yet remains flexible. I love this pen - it looks and writes great and was quite reasonably priced (however the quality is on a level of pens costing far more). I got this black beauty at the 2010 NYC Pen Show.